Siena, viewed from the Fortezza Medicea. 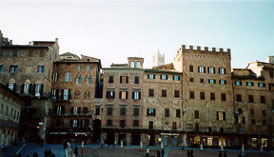 Inside the Campo in Siena. 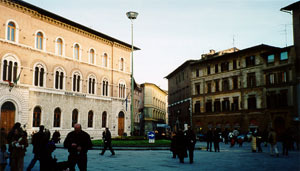 A piazza in Siena (not pictured: the McDonalds located in the piazza). 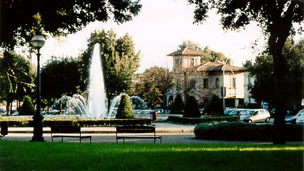 This pretty fountain is in a park just outside of the Fortezza Medicea. 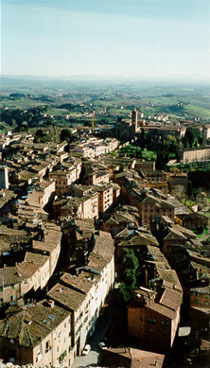 (Left) Siena from the top of the Torre di Mangia in the Campo. Notice how the buildings snake and weave along the hills. 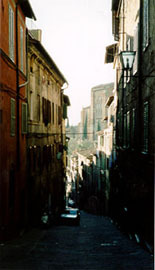 (Below) Two pictures of Siena streets. The streets aren't as narrow as those in Firenze and Lucca, but they aren't as wide as those in Pisa either. 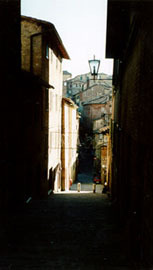 These pictures show how steep and shaded some of the streets are in Siena.